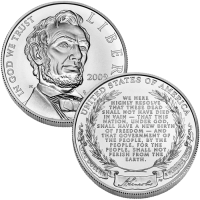 One of the most popular commemorative coins in recent history, the 2009-P Abraham Lincoln Commemorative Uncirculated Silver Dollar was released on February 12, 2009 to celebrate the bicentennial of the birth of the 16th President of the United States. It took a mere six weeks for the coins to reach a sell-out status along with a companion proof version coin featuring the same imagery. The US mint also issued four new cent coins during the same year as part of the bicentennial celebration. The design for the commemoratives was released by the Mint on November 19, 2008 during the 145th anniversary ceremony of the dedication of Soldiers’ National Cemetery in Gettysburg. It was especially fitting as the reverse of the coin contains the last 43 words of Lincoln’s famous Gettysburg Address which he gave at the original dedication. 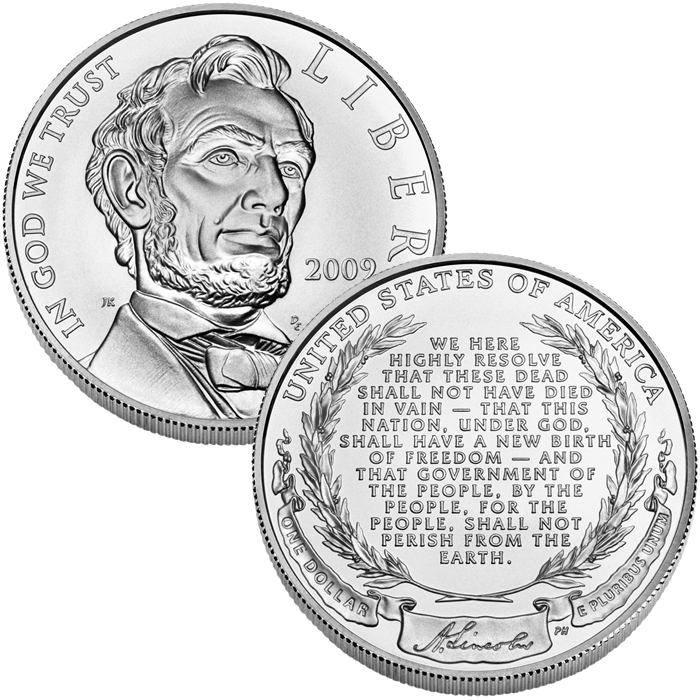 2009-P Abraham Lincoln Commemorative Proof Silver Dollar – features identical imagery to this uncirculated silver dollar. 2009 Lincoln Coin and Chronicles Set – contains a Proof Lincoln Silver Dollar and proof versions of the four 2009 Lincoln Cents. 2009 Lincoln Birthplace in Kentucky Cent – circulating cent featuring a log cabin on the reverse signifying Lincoln’s childhood home. 2009 Lincoln Formative Years in Indiana Cent – circulating cent featuring a young Lincoln taking a break from rail splitting and reading a book. 2009 Lincoln Professional Life in Illinois Cent – circulating cent featuring an adult Lincoln in front of the Old State Capitol in Springfield, Il. 2009 Lincoln Presidency in D.C. Cent – circulating cent featuring an unfinished U.S. Capitol dome as it would have been when Lincoln was in Washington, D.C.
Each Abraham Lincoln Commemorative Uncirculated Silver Dollar is struck from 90% silver and 10% copper. The US Mint released the Abraham Lincoln Silver Dollars on the bicentennial of Lincoln’s birth – February 12, 2009. An introductory price of $31.95 was offered by the US Mint for the Lincoln Coin. Prices were raised to $33.95 on March 16, 2010. A ‘P’ mintmark found on each coin indicates it was struck at the US Mint’s facility in Philadelphia. Inspired by Daniel Chester French’s famous sculpture of the President inside the Lincoln Memorial in Washington, D.C., the obverse (heads side) was designed by Justin Kunz and engraved by Don Everhart. The reverse (tails side) was designed and engraved by United States Mint sculptor-engraver Phebe Hemphill to show the last 43 word’s of Lincoln’s famous Gettysburg Address – WE HERE HIGHLY RESOLVE THAT THESE DEAD SHALL NOT HAVE DIED IN VAIN – THAT THIS NATION, UNDER GOD, SHALL HAVE A NEW BIRTH OF FREEDOM – AND THAT GOVERNMENT OF THE PEOPLE, BY THE PEOPLE, FOR THE PEOPLE, SHALL NOT PERISH FROM THE EARTH.